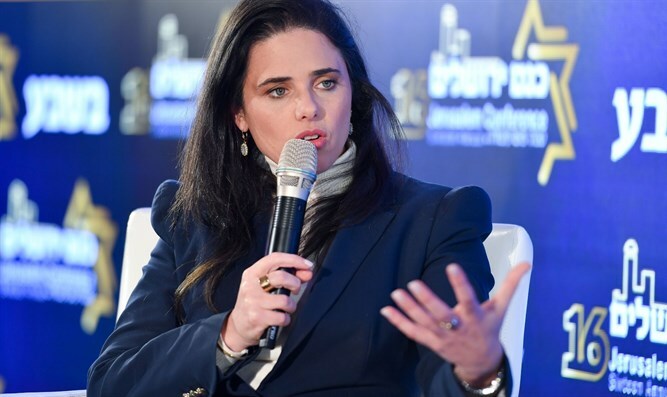 Justice Minister Ayelet Shaked said today the decision to leave the Jewish Home Party was difficult for her, but that the move was right and helps to increase the right-wing bloc. "Leaving Jewish Home was hard for me emotionally but intellectually it was the right thing to do. We already see it will only contribute to increasing the right-wing bloc," Shaked said. "We wanted to do it at the time when we went with the late Rabbi Ronsky to Jewish Home and it didn't work for us. Now we see the change and I hope the two parties together will bring fourteen seats." According to her, US President Trump's peace plan will be published after the elections, before the establishment of the next government. "We want to gain a lot of power so that even if left-wing parties come and want to join the Netanyahu government, we can ensure that a right-wing government is established and no Palestinian state is established." Shaked emphasized that the New Right is an Israeli challenger who will run in the future for State leadership. "I'd definitely like religious Zionism to vote for us, but we're not appealing just to this public but to all the public, religious and secular alike, and really when we look at our voters we see it clearly: Half religious and half national. Shaked concluded with satisfaction in the last four years she served as Justice Minister, and intends to remain in the Ministry as long as it's up to her. "My greatest achievement is in settling communities in Judea and Samaria and my second achievement is appointing new judges. There were no Ethiopian judges, today there are. I appointed a haredi woman judge. "I definitely outlined office policy and was well versed in all the details," she added, "The Attorney General has to implement his worldview in the framework of the law, and in most things we worked well. There were really things in which we were divided, but they were few; ask other ministers and you'll see the Attorney General tried to help. Ministers have to play their part. "Once in the Justice Ministry they didn't let soldiers receive benefits and today they do," Shaked said. "Of course, there's a lot of work and space to aspire, but it can certainly be said that most of the clerks in the Justice Ministry understand that its job is to enable the political echelon to fulfill its role." Shaked wants to continue serving as Justice Minister in the next term as well: "I have a lot more work to do."